Insightful singer/songwriters who play acoustic guitar don't get very far in the US, unfortunately. You'll get played on college stations, but since airplay is totally controlled by public corporations, that would be about it. However, go to Europe and the undiscovered gold from here gets dug up and treasured. It's no secret that the UK music magazine Uncut is passionate about their "Americana." 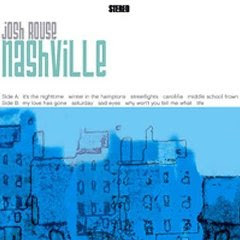 Maybe that's why when after a handful of albums and a marriage down the tubes, Josh Rouse gave up his adopted city of Nashville and moved to Spain. His Rykodisc album, 1972, was a paean to the golden era of soft rock, and the critics clamored over this breakthrough record to no avail. He decided to pack it up and head across the pond, but before he did, he recorded his farewell to the old life with producer Brad Jones and released Nashville. You may think you're in for some heartland country music, but no. The name of the game is folk-rock with nods to 70's soul and pop and no sappy stuff either. The standout cut is "Winter In The Hamptons," which is one of those songs you wish would go on for longer than its 3:06, perhaps with another solo because the chord progression is so damned juicy. Nicking a little from the Police's "Message in A Bottle" guitar pattern, this is a folk/rock pop gem that just glides fast and carefree, with the absolutely killer hooks and singalongs. From experience, I can tell you that winter in the Hamptons is quiet, beautiful and possibly truly dull. It's like the rich and famous are out of town, so it's a remote still life with limited things to do in the cold weather. Rouse uses that vibe as a metaphor for nothing left to lose but flying away to the new life in Spain. We have stayed too long. Because the forecast is rain clouds. As you'll see from the videos below, it's the opening a capella singalong "ba da da da dahhh" that sticks right in your head from the start and clearly gets live audiences singing along. Rouse has been in Spain a few years, so YouTube is full of Rouse concert videos from all over that country, and man, do they love that guy. There are a couple from two years ago with stops in LA and Brookyln that are just as enthusiastic, so it's heartening to see there is still strong support here too. The first video is a very well-done purposefully grainy production for "Winter in the Hamptons" followed by Rouse and his crew singing the song in the middle of the daytime at the Plaza del Trigo in Arana de Duero in Spain from this past August! I hope you fall in love with this song as much as I have.